Click below to see details about our previous litter. I do not breed frequently, so that I may enjoy my own dogs and be the best support system for my current owners. I also want to see health testing results from the previous litter before I make a decision on breeding again. I will not create a "wait list" of potential owners until the sire is chosen and the litter is planned. This website will be updated when that happens. I do not invite potential owners into our home until after the litter is planned, so please do not ask to come visit. We would however, be more than happy to meet you at a lure coursing event or dog show, so you can meet our dogs. Is a Rhodesian Ridgeback the right dog for you???? A Rhodesian Ridgeback is NOT the dog for everyone. I prefer potential homes that are active, with Ridgeback or large dog experience. There are some exceptions however, depending on your lifestyle. ....Is to provide you a temperamentally sound, healthy companion, and to offer knowledge and resources for raising a Ridgeback puppy, all the way until your dog is an adult and throughout his lifetime. Breeding is done very infrequently and is taken very seriously. We do not breed because someone wants a puppy. We breed for us, and when we feel we are ready to commit to the time it takes to raise a litter properly. temperament evaluations at eight weeks of age. nor do owners get to pick their desired puppy. When you come to visit puppies, you have only a small snapshot of what that puppy is actually like. Seeing them every day and working with them one-on-one with training will give you a much better picture of what each puppy is like and what a potential home should be like. is destined to become a show dog. We seek homes that are active and/or familiar with big dogs. some valuable quality to contribute to the gene pool. If you are interested in showing your puppy or in having a professional show your puppy, please let me know. as show potential, may not develop into a dog we feel is worthy of showing or breeding as an adult. We seek out prospective companion homes that are extraordinary. Our owners are held to a very high standard and I expect all owners to be responsible pet owners that will represent the breed in a positive way. I encourage each owner to purchase the on demand Videos from Puppy Culture so that they may continue what I have started as far as training and socialization goes. I work extremely hard to ensure these puppies have an excellent start and it seems futile if the new owners do not know how to continue with appropriate situations and proper socialization. The first year of your puppy's life is incredibly busy. You MUST get your puppy to classes beginning almost as soon as they come home. A QUALITY dog trainer understands the relationship between beginning training as early as possible and making sure the puppy has his/her first vaccines. If you wait until your puppy is completely vaccinated to begin classes, you are missing a huge window of time. ~~ Attend organized training classes with your puppy and strive to complete the AKC CGC or Puppy STAR. ~~ Get the puppy out into the world and socialized several times a week for the first year. ~~ Provide age appropriate exercise on a daily basis throughout life. ~~ Be consistent during training and set a schedule for house-training. ~~ Understand the relationship between reduced topical pesticides,vaccines and a healthy diet. ~~ In case of emergency where the puppy needs to be re-homed, the puppy will only be returned to us. ~~ Feed a high quality premium diet of select kibble or raw foods. ~~ If you work full time, provide an outlet for the puppy to potty during the work day (dog walker, daycare, etc). ~~ If you live in a single family home and have a fence this is preferred. However there are exceptions. If you cannot absolutely meet the requirements above, your home is not suitable for one of our puppies. All puppies go to new homes on a signed contract, micro-chipped and registered with the American Kennel Club. No exceptions. First and foremost I want all puppies to have a happy home life, where exercise, training, socialization and nutrition are the top priorities. Although it can and does happen on occasion, re-homing a puppy or dog because it is not the right fit is the last thing we want to do. We will always take back a puppy no matter the age, reason or circumstance. 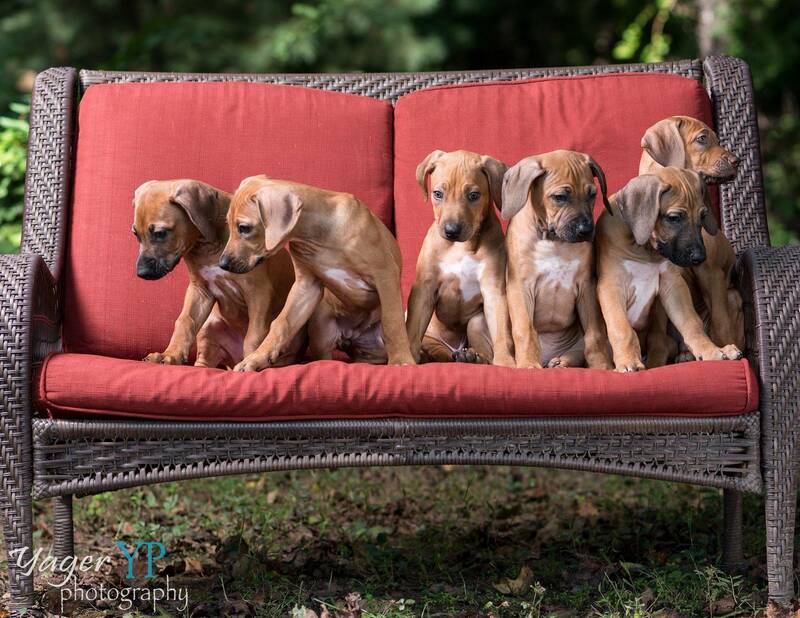 PRICING INFO --->> How much do Rhodesian Ridgeback Puppies Cost? Raising a litter of puppies is utterly exhausting. Add in the extra training and desensitization that I do, and by the time they go to their new homes, I am ready for a vacation. I use most of the protocol from the Puppy Culture program because I want to give the puppies the best possible start that I can. Puppies are raised in a clean environment (no nasty newspapers, no kennel run) surrounded by daily stimulation and one-on-one training exercises. Below is a play-by-play of sorts, how they are raised here. Puppies are whelped indoors in a quiet room away from the hustle of household activities. They are handled and weighed daily. I do not remove front dewclaws unless there is a problem with them not being attached well. Based on research, removing the dewclaws can cause arthritis at a later age. For performance dogs, they do use their dewclaws when turning, so I feel it is important for them to keep them. The chance of injury to the dewclaw is slim and the benefits of keeping them on, far outweigh the risks. Removing them is purely cosmetic and there is no need. At three days of age, continuing until sixteen days, Early Neurological Stimulation (ENS) is started to introduce the puppies to a small amount of stress. Once eyes and ears open, the startle reflex is exercised by making loud noises, such as slamming doors, running the vacuum, and dropping things on the floor. They are also exposed to a soundtrack of different sounds, including crying babies, airport terminal, skateboard park, dog show sounds, barking dogs, thunder, gunfire, fireworks, and other things. At around three and a half weeks, puppies move to their weaning/growing room. They get started on some raw meat and eventually nursing from mom is cut back once they are eating food reliably. 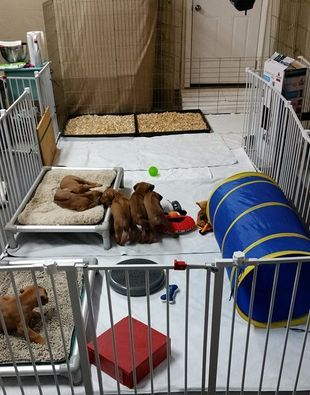 Their weaning room is a larger area set up with a defined sleeping area, play area, and potty area. They also have access to a safe outdoor space where they can run and play. As the puppies grow, so does their space. At around four weeks, depending on their development, and when they begin to take food reliably, they are introduced to the clicker and learning how to learn. Puppies learn what the clicker means, and how to ask or "mand". Show potential puppies also begin to learn how to stack for the show ring. Visitors begin coming when puppies turn five weeks, and puppies are separated to eat in their own crates. At six weeks and beyond, visitors continue. Their play area gets bigger as they grow and they are exposed to more and more things outside such as cars, sirens, the garbage truck, lawn mowers, leaf blowers and other sounds they will encounter in their adult life. They are also exposed to different footing surfaces including tile, grating, linoleum, carpet, hardwood, decking, grass and dirt. Unstable surfaces are also introduced such as wobble cushions and an ex-pen covered with a tarp. They eat in new and different places and are challenged at mealtimes using barriers to overcome and having to walk into a new room to eat. This slightly stresses them and helps them with problem solving. I do not help them figure things out. Toys get switched out every few days so as to keep things new. They have access to a small pool with water, stairs, wooden decking, a ramp, a tunnel and other things. Puppies will meet nearly 50 different people before they are released to go to their new homes. At seven weeks, temperament testing is done and at eight weeks conformation evaluations are done. This will determine which puppy goes to which home, and which puppy is staying. Puppies will continue to have more space to play and be introduced to things like a lure coursing bag, trips in the car, leash walking, and guests come dressed in various types of hats, glasses, and clothing. Between nine and ten weeks, puppies go to their new forever homes. **NOTE: For our next litter I may change the go home period to closer to 11-12 weeks to ensure all puppies are completely through their fear period. The below photo shows how mealtimes are handled. Starting between five and six weeks, each puppy has its own crate to eat in. Each puppy is put in their crate and they are expected to sit, before the food bowl comes in. After they are finished, again, they must sit before being let out. This discourages food related behavior issues, works on crate training and teaches them that patience pays.